December 17, 2016, 1:43 PM · Probably most people do play a 'factory' violin, because they are the most prevalent and easy-to-afford. In fact, I played one for many years and loved it quite a lot. Of course, I was a little deflated when I learned that the violin, which came from my grandmother's attic, was not actually a Stradivarius. "It's an old Germany factory violin," said the luthier, examining my beloved fiddle. He then attached a rather low monetary value to it. 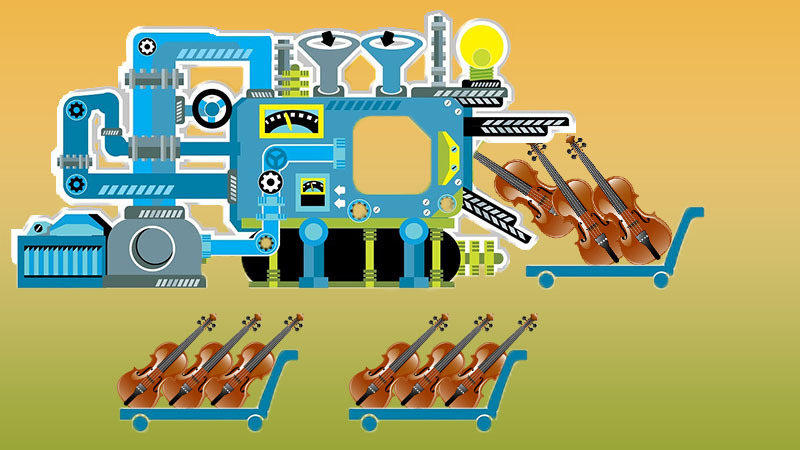 This idea of a "factory" violin fired my imagination; I envisioned violins being stamped out by some kind of elaborate and mysterious machine. That's pretty far from the truth, and a recent discussion here really drove that home for me. Violins are handmade, whether they are "factory" or "bench-made." One can use better or worse materials; one can employ skilled or less-skilled humans with knowledgeable or less-knowledgeable supervision; one can have 50 people on the assembly line or just one person in a studio; but they are made by hand. I imagine the worst-possible VSO (violin-shaped object) still requires nearly as much labor as the finest fiddles being made. Tell us about your experience with 'factory violins' -- that is, violins that are mass-made by assembly line and carry a brand name, rather than those made by an individual luthier or shop. Chances are, at some point in your development, you have played one, if you don't play one now. I've played several, and my students have some very good ones. I can thank 'factory violins' for allowing me to learn to play! What is your story and your thoughts on the matter? December 17, 2016 at 10:56 PM · Good morning my name is Micaela and I am from Peru I will go. For 1 month to the US and I want to go with the purpose of learning violin. Already playing some music but I want to be professional in the violin please help me I care a lot I have 12 years and I do not waste my time. Since I played violin and I urgently need an Academy in New York. December 17, 2016 at 11:01 PM · Hi Laurie, it's not so much what you can see when looking at a violin that is important - it's the things that you cannot see that really matter. As a professional violin maker my violins don't look all that different to factory 'hand made' violins. However the differences are in the care and craftsmanship that I employ right from the start by choosing the finest alpine tonewoods, seasoned and of the right densities through to tuning the plates and crafting a bassbar of the correct shape,length and position through to cutting a high quality fitted bridge to name just a few .There is a whole raft of aspects that need careful consideration in violin making that in a mass produced instrument can simply be skipped over without it being visible. A discerning musician and artist however will notice the enormous difference this will bring about. Naturally mass produced violins have their place but so do individually hand crafted instruments by artisan luthiers but they do cater for different needs. December 18, 2016 at 01:26 AM · Very interesting video : thank you for posting this. I loved watching them cut the F holes. Which steps would be regarded as the most difficult/important ie. requiring the highest degree of skill ? December 18, 2016 at 01:33 AM · After decades, I recently started learning again. My old mediocre violin needs repairs and I am hours from any luthier or violin shop. I ordered an inexpensive Chinese-made violin through the local music store, which has an acceptable sound, and will improve as I improve my tone. In the future I will probably seek out a better violin, but for now it suits my purposes. December 18, 2016 at 03:40 AM · To answer Brian's question (or not), probably grading the plates. I don't know much about violin-making, but I thought that the plates were supposed to be graded and thinned according to tap tuning and not only to thickness. That would seem to me to require significant training, knowing where to remove material in order to improve the tap-sound of a plate. In the video thicknesses were measured only using a caliper, and grading plates that way doesn't seem like it should be that much harder than carving a scroll. I'd love to see a video of violin-making that uses as much robotic equipment as is practicable with current technology. December 18, 2016 at 03:53 AM · Hi Miss Laurie, I came to own my first violin this way, my Wife and I were visiting the Land Between the Lakes Area of Kentucky and stopped in to explore an old junk/antique shop in the small town of Cadiz. Among a bunch of old cracked violins my wife found an old wooden casket style case with a tag that read, "Civil War era fiddle case 75 Dollars". It was in bad shape, she wanted to plant flowers in it but couldn't get it open. I pried it open and found an old violin inside. The store owner was selling it as a "case" only and had never bothered to pry it open. Not wanting to rip him off I laid the case on the counter and asked him, "Did you know there is a violin in" He interrupted me saying, "I don't know anything about violins, don't ask me anything about any violin you saw over there. When I tried to explain again he became quite cross and said , "Look, you want the case or not?" So I bought the "case" With the old violin inside for 75 bucks! The strings, bridge, and sound post were all still in place, a Luthier I took it to said the good news is it's a hundred years old and playable, bad news is it's a cheap American factory violin. He said it was worth around 500 dollars retail. I learned to play on that violin, I still have it even though I have invested in a quality one since. I still use it as my emergency backup, and to learn new pieces on. Can't imagine not having it ready to play, and I still keep it in that old case. December 18, 2016 at 08:43 AM · The expression 'a poor workman blames his tools' is relevant here. There is a huge snob value attached to those who play a handmade as opposed to a factory made instrument. In reality of course, it depends the skills of the violinist - some will make a factory model 'sing' whilst others will kill it stone dead. Yes, there are good and bad factory made instruments, as well as good and made hand made. It doesn't really matter as long as you enjoy playing it and getting the most of the instrument - irrelevant of cost! December 18, 2016 at 08:57 AM · I too, when a youngster, played a German "factory" violin with a Stradivari label. It got me a distinction in ABRSM Grade 8, but a huge crack opened up in the belly. Dealerships sneeringly said that it wasn't worth repairing. I'd squirt glue along the crack and then hold the instrument in front of the fire, hoping some would soak in. Actually, that DID stop the violin rattling for a while ! My exit strategy was to change to viola, with, yes, a "factory" viola that cost £15 including case and bow. I didn't own another violin until my fourth year as a student. I played on borrowed ones when asked to play second fiddle in a quartet. Men in suits at dealerships will sometimes call factory violins "trade fiddles". Trade means "made to be sold" ?? Whatever they are called they have to work otherwise there would be no point at all in making them. December 18, 2016 at 09:08 AM · I have not owned a factory violin, but one of my students did. His wife chose it for him primarily because it was inexpensive. Much to my surprise, it sounded quite good for a beginner violin. Thanks for posting the video, Laurie. It is quite instructive. I must admit that I cringed at the site of colorless wood which was stained to look like violin-grade wood near the end of the manufacture. December 18, 2016 at 01:04 PM · A very enlightening video. Thanks for posting it. My luthier tells me the 'new' Chinese violins are quality instruments....and I personally know the 'new' Romanian violins (Barcus-Berry and Realist) are well made and sound fine for what I do, i.e.,tools to connect me to my audience thru the joy of music....Merry Christmas and best wishes for 2017! December 18, 2016 at 03:14 PM · Many makers have assistants. A very large number of the violins produced are the result of joint effort. I entered the shop of a Cremona maker, once, and found the man whose name is on the labels standing there in a suit whilst a relative youngster toiled at the bench. Makers such as Stradivari and Vuillaume had large workshops; the great Antonio's sons worked in the one, and the finest makers from Mirecourt slaved in the other. Indeed many makers' works are produced by a team. Exactly who did what becomes a puzzle for experts in the years following manufacture. Did I read somewhere that Lucci's wife made the scrolls, and Garimberti's spouse varnished his instruments ? And very few will make their own fittings, such as pegs and tailpieces. The name on the label is that of the person who takes overall responsibility for the product. This person is a "merchant". Remember those vast list of credits at the end of TV programs and films ? Should it ever be thought necessary to name all the workers involved in making Stentor instruments on the labels, only double basses and 'cellos would be big enough ! The question I'd like to ask is - how many hands have to be involved before a violin is deemed to be a "factory" or "trade" one ? Where's the line in the sand ?? I played a J.B. Vuillaume violin for many years; was that a "factory" violin ? BTW I know of one professional orchestral player working near me (in a quite exalted seat) who owns 2 Chinese violins. There's a local craftsman who gets these & adjusts the settings, getting good results. December 18, 2016 at 04:49 PM · Rolf, you are so right, and thank you for that list of important but "unseen" elements. Pauline, actually all violins go through a stage when they are "in the white" -- I did not realize this until I visited a luthier who had a few at this stage! The wood only gets darker after they paint and treat it. I can't claim to be an expert on it, but the quality of the wood of the violins in that video might not be all that bad; it did seem like they were using at least the right kinds of wood etc. I think there are many gradations of quality and treatment from factory to factory, and from luthier to luthier. December 18, 2016 at 06:53 PM · My Mittenwald-Strad (M-S) is one of those mid-late 1800's violins that came out of some "factory" in Germany. Yes it was hand made and somebody, or group of somebodies, put more than a little effort into its construction. It has some rope style inlay on the edges and a good amount of intarsia on the back as well as the original finger board, pegs and tail piece. Unfortunately the pegs broke and the fingerboard warped and all had to be replaced (I still have the original parts in a box). I've invested more than the value of the instrument in getting it brought up to good orchestra playing condition and since I don't play solos this is my instrument. It also has sentimental family value as it came to America in the hands of my wife's Great Grandfather when he emigrated from Sweden. Family stories abounded about Grandpa playing it in church and at family gatherings. Call me a bit weird but I think that the instrument actually likes playing hymnody. When I play stuff from the hymnal he sings his best (ok: I like hymnody as well so maybe it's just me being anthropomorphic). FWIW: I did own a solo quality instrument (by Reinhold Schnable) for a time but we simply did not get along despite the fact that my teacher told me that I would develop into being able to play it as well as he could. After my teacher died and I became an autodidact (after about 30 years of lessons), I sold the Schnable (kept the Adolph C. Schuster *** bow though because the M-S loves that as well). December 18, 2016 at 09:50 PM · I used to have a 1974 Roth 120R. While seemingly well made and adjusted, it lacked a depth of tone that I wanted. I currently play a 1920-30's Leon Mougenot Jaquet Gand factory violin now and I love it. It does have a thin chippy spirit varnish with a few chips and scratches, but that is my only complaint with it. The violin is set up great and sounds quite good. The fiddle is paired up with a no-name german trade bow from just about the same period. I've taken my violin to shops in Chicago to get annual work done and been told that it is a very nice trade violin that is built well and has no structural problems. They said it would cost a considerable amount of money (More than 5K) to come close to getting something better. December 18, 2016 at 11:35 PM · Regardless whether it's a factory violin or a handmade violin, a violin can only be as good as the player. December 19, 2016 at 09:41 AM · I received a new violin for my confirmation, which my grandmother had bought from an old lady who’d found it in her attic. I played it for over 30 years until I bought a brand-new violin made that same year (2008). The label reads, “Schuster, Markneukirchen, 19 –“. So for years I thought it was made by a Herr Schuster. It was only when I started doing research on the violin in Japan and Suzuki Masakichi’s violin factory that I learnt more. Schuster was not a luthier, but one of the wholesellers in Markneukirchen. In 2008 I visited Markneukirchen. One of the archivists in the museum of musical instruments introduced me to a local luthier who has also done research in the history of violin making in Markneukirchen. He looked at my violin affectionately and said it was a typical product of local violin making. The maker couldn’t be identified, presumably because there was no one maker. “So it wasn’t Herr Schuster,” I said, remarking on the label. “Well, at least it doesn’t say ‘Stradivarius,’” he replied. When I laughed, he pulled open a drawer and showed me a role of labels marked “Stradivarius”! Loads of these violins were shoveled onto train (in those days Markneukirchen still had a railway and the station was in the centre of town) and exported to many countries, the U.S.A. included. There was even U.S. consulate in Markneukirchen at one time and the museum archives have English language catalogues. I’m sure they must have exported to Japan too, although the archivist seemed to doubt this. I mean to investigate more closely one day. Although I bought my new violin that same year, I kept my “Schuster”. In fact, if I were forced to surrender one of the two, I’d keep the Markneukirchen instrument, although it is clearly inferior and I haven’t played it for ages. When I started playing the new instrument my feelings were very similar to those described by Arnold Steinhardt in “Violin Dreams”, i.e. as if I’d jilted a long-time lover. December 19, 2016 at 10:59 AM · On a holiday, early 70s, I spotted a viola in a Plymouth (UK) music shop. "Looks all right" said my wife. I think they had bought it as part of a job lot. They wanted only £8 for it. Bought it. Unlabelled, and obviously a French "factory" viola, it sounded well when we got it home and had it set up. Years later a colleague looking for a viola for a pupil bought it from me, but he liked it so much that he kept it for himself. This man, when a student at the Royal Academy in London, was allowed to play on the "Archinto" Stradivari viola, which he disliked. SO, a "trade" viola can be more satis"factory" than a Stradivarius ..... ? December 19, 2016 at 03:02 PM · My Viola was made in a factory in Ohio in 2013. It was not made by the assembly line, it was an example made by a luthier who works there for the others to model after. I am the first violist to play it and it is the best viola I have ever played. My violin is from the same company in 1990. The violin is an assembly line instrument, and it is not quite as good. It can project fine and it sounds good. It isn't as pretty as the viola and it doesn't play very deeply, but it is still pretty good. I teach with that violin, but most of my pupils I teach with a viola because my pupils are mostly violist and cellists. December 20, 2016 at 01:53 AM · Oh yes. I've definitely played on several factory violins. Except one, all are pretty good, and I'm using one right now... I also have a bench-made one as well. December 20, 2016 at 07:09 AM · I know my viola (made in this century) is factory made, and my violin probably is. The violin's label has the name of a not-so-well-known Italian violin maker on it; someone told me this was often done so that people wouldn't question the provenance ("Well, I _know_ Stradivarius didn't make it.") My violin is OK but my viola is very good. December 21, 2016 at 03:49 PM · "The violin's label has the name of a not-so-well-known Italian violin maker "
Many violin books have life-size photocopies of prestigious Italian violin makers; and I think that one can buy pages of such on ebay !! Very tempting for a vendor to cut one out and insert it in a "factory" violin and boost up the price. I've been caught out recently by an ebay violin with a genuine-looking Enrico Piretti label... BEWARE !!!!! (Though the violin plays well enough it's probably from Markneukirchen). December 22, 2016 at 05:47 AM · David, the date on the label is way pre-ebay and the evidence is that the violin is as old as that date claims it is. I assume the violin started its life with this fake label. I did pay more than what people claim these German trade violins are worth, but not thousands more, and it outplayed other violins I tried that were being offered for at least $1000 more than I paid, so I'm satisfied.